Ghetto tubeless inflator – total cost 9p! This topic has 142 replies, 100 voices, and was last updated 2 years ago by ahwiles. Mine has one valve in the cap, one in the bottom. Before fitting the valve stems to the bottle, I have put a locking collar, then a large washer, then a 1/2″ tap washer and this seals very easily. With both valves in the cap it’s a bit crowded but you could probably use normal washers and the smaller size tap washer (3/8″). Chaps you are all brilliant thanks. I put one in the cap and one in the base of the bottle. There not mega tight just enough to compress the sealing rubber. Then i pump to 80psi and it usually pops the tyre on and inflates to about 30psi. Just tried it… and it worked! another happy customer here, worked perfectly. Cost me a whopping 20p for a value lemonade bottle, guess thats inflation since the original post 3 years ago! Brilliant. I’m totally pumped now. Excellent guide thank you! Was struggling to re inflate one of my tyres after taking it off the other week. I used a schrader valve to inflate the bottle with a presta cut in half to attach the tube to straight on the my removable core valves. Anyone after the tubing just eBay search for PVC flex, I got 1 meter but 50cm would suffice. I would think pet shops and aquatic shops also sell it for fish tank set ups. I also superglued around the valves on the bottle lid to stop any leaks and also had to glue the pipe on the bottle valve as it popped off. Here is my device for pumping tubeless tires ..
2 litre sparkling water bottle worked for me yesterday. Had to remove the valve stem core and pump to 60 psi but worked a treat. Where are people getting the taps from? I tried a plastic fuel tap, but the air pressure blew it apart! I took a tee and valve in the store sells equipment for garages. If somebody could post a link to a site selling the valves in the higher end versions of this set-up I’d appreciate it. * Tubing that fits snugly over a presta valve. * Air from a donor bike tyre. I used another donor bike as the air chamber. I got enough air with a 26″x2.1 at 65psi but it took a few goes as I wasn’t using washing up liquid. It’s not quite quick enough to do instant pop inflation. A plastic bottle with higher pressure as per the original suggested ghetto setup will be superior, but you could still make it with just one valve in the lid. Take the tube end without the nail and push it over presta valve of the wheel to be inflated. Take the other tube end *with* the nail and push onto the value of the donor bike wheel. The nail should press the end of the valve and release the air. Just built one, fitted 2 new tyres, the first tyre without the inflator approx 2 hours of swearing & struggling… 2nd tyre with inflator approx 10mins… wow. Please note. Does not include time taken for KFC break. Using Nobby’s thread from a while back HERE as inspiration, a couple of emails to the man himself, I’ve gone the posh way and made an inflator out of a CO2 fire extinguisher. I’ve had to buy some pipe fittings to get things to work properly, but then this thing will survive the apocalypse. Also went proper posh with the hose and valve head, Topeak hose and head. 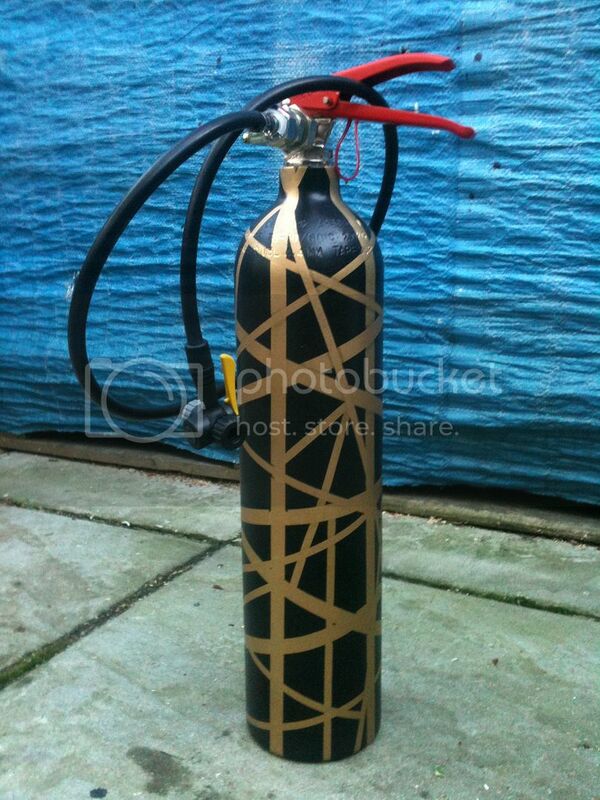 I just need to paint it now, I don’t want anyone to mistake it for a fire extinguisher. So its either going to be a gold and black version of Eddie Van Halen’s Frankenstrat, or graffiti paint and sticker bomb. Not sure if I’ve got enough stickers. 2 Coke bottles linked up using a T piece worked loads better then 1 coke bottle . I got busy with the masking tape and rattle cans. Experiments with pressures reveals that 140psi in the bottle blows the tyre right off the rim. Good job there wasn’t any sealant in there! 120psi is enough to mount even the subornist Trail King ghetto style. Wouldn´t have believed that it could be so easy. Trail King at first try! Apologies for resurrecting this old thread but I bought some Schwalbe Rocket Rons recently and was having trouble getting them to go up with a track pump. I’ve never had any trouble with other tubeless tyres such as Maxxis and Specialized but for some reason the Schwalbes just didn’t want to seat and go up. I tried all the usual dodges suggested on the internet but still no joy. FYI, I’ve found mine just as successful at 30-40 psi, you don’t have to go nuts. The topic ‘Ghetto tubeless inflator – total cost 9p!’ is closed to new replies.